In April of 1918, soon after the Virginia General Assembly voted to allow coeducation at the College of William and Mary, some students were dismayed and took to the pages of The Flat Hat to express their discontent. In one way, this student was right — the “old College” was never again the same as it had been. But in another way, this student’s words reflect another element of the College’s history: It has always been William first, and Mary second. From the signing of the royal charter in 1693, the second-oldest university in the United States has been a bastion of white patriarchy. While it is true that when the College became the first public university in Virginia to admit women in 1918, it was at the cutting edge of progress in its time, that was only a small step toward shifting the balance of power. It was not until half a century later, in 1967, that the College admitted its first African-American students in residence. It was only this summer that the College inaugurated College President Katherine Rowe, the first woman to hold the position in the school’s 325 years of existence. The College’s history is also marked by the oppressive systems it has perpetuated. From 1693 to 1865, enslaved men and women labored at the College. The Lemon Project studies the history of African Americans at the College and promotes reconciliation efforts today; on the same list where researchers found the project’s namesake, Lemon, names like Lucy, Kate, Nanny and Effy also appear. And an enslaved girl named Fanny who was owned by the College is known to have attended the Bray School — a free school for enslaved children in Williamsburg — in February of 1769. It is undeniable that women have been a part of the College’s history since before its first brick was laid and the land was occupied by the indigenous people of the Powhatan Confederacy. Since 1918, more than 50,000 women have earned degrees from the College, and today women make up 58 percent of the student body. Yet, the reality is that walking around campus, the overwhelming majority of the names you see on buildings are those of men. All but one academic building – Adair Hall, named for Alumni Medallion Recipient Cornelia Storrs Adair ’23 – are named for men. There is not a single statue on campus that memorializes a non-male or a person of color. The Griffin received the distinction of a statue before a woman or person of color did. “Welcome to the College of Mary! Our tour begins at the Katherine Rowe Building, which is the oldest college building still standing in the United States. It is named after Katherine Rowe, the College’s first woman president. This year — the year which also marks 100 years of coeducation at the College — the Board of Visitors unanimously elected Rowe as the 28th president. Now if you look to your left, you will see another one of our longest-standing structures, the Cockacoeske Building. In 1677, 16 years before the College was chartered, Charles II of England and various local tribes signed the Treaty of Middle Plantation. This treaty made the settlement of Williamsburg, and therefore the establishment of the College, possible. The Cockacoeske Building commemorates the legacy of the Queen of Pamunkey, the first tribal leader to sign the treaty. Yet, this building has a storied and tragic chapter in its history, as it once housed the Brafferton Indian School, where indigenous boys, some kidnapped by traders, were educated with the aim of assimilating to the ways of British settlers. Some of those students died at the College after being exposed to European diseases their immune systems were not equipped to fight. On your left is the Miriam Johnson Carter statue, dedicated in honor of the first African-American woman to attend the College in 1955. Initially, Carter applied to the College’s graduate program in education, but her application was rejected on the grounds that Virginia State College offered the state program. Carter wrote letters to the College explaining that she could not afford to travel to Virginia State College to participate in its program. She tried in vain to gain admission to other College-affiliated programs. Finally, after much persistence, she was accepted to the College to study law. Sadly, she withdrew at the end of her first academic year. On your right you’ll see the beautiful, newly renovated Mary Jo White Hall, which is home to the government, economics and international relations departments. It’s named, of course, for the 1970 graduate who was the first woman to hold the position of U.S. attorney in Manhattan. You might also know her as the chair of the Securities and Exchange Commission. As an attorney, she was known for her effectiveness in prosecuting white-collar crimes. We’ll pause our tour here at the Legacy Three Memorial Garden just behind Lillian Poe Ashcraft-Eason Hall. The memorial garden is named after Lynn Briley ’71, Janet Brown Strafer ’71 M.Ed. ’77 and Karen Ely ’71, who were the first African-American undergraduate students to live in residence halls at the College. Stand right here in the center and you’ll hear an echo that no one else around you can hear when you speak. We are now passing Ellis Stadium, which is named for alumna Jill Ellis ’88. Ellis is the coach of the U.S. women’s national soccer team. She led the team to a FIFA World Cup victory in 2015. Whether you’re a fan of football or fútbol, Ellis Stadium is the place to be. The College’s football and soccer teams play all of their home games at Ellis Stadium. Just behind me is the Braithwaite-Hinton Science Center. If you’re not a science, technology, engineering and math student, you will probably only take one or two classes here during your time at the College. You will also probably get lost trying to find that class. The Braithwaite-Hinton Science Center is named after Minnie Braithwaite and biology professor Shantá Hinton. In 1896, Braithwaite petitioned the faculty to allow her to attend chemistry lectures. The faculty denied her petition in a 4-3 vote. Many credit her for being one of the first women to attempt to gain admission to the College. The Science Center is also named after Hinton, who became the first African-American faculty member to be promoted and tenured in any of the science departments. Here at the outer edge of New Campus, we have Leisa Meyer Hall, infamous for taking the breath out of generations of students as they hurry to climb the three flights of stairs to make it to class on time. American studies, history, and gender, sexuality and women’s studies professor Leisa Meyer has worn many hats in her time at the College. She was one of the faculty members who helped found the gay and lesbian staff group, now Equality W&M, and has been involved in numerous LGBTQ advocacy and research projects during her time here, including the development of Safe Zones, which have made this campus a more inclusive space for LGBTQ students. Up ahead is the Beth Comstock School of Business, named after successful businesswoman Beth Comstock ’82. Comstock graduated from the College in 1982 and went on to co-found streaming giant Hulu and serve as the vice president of public relations for General Electric. Our tour comes to a close here at the Undergraduate Admission office. And it’s easy to miss, but if you look right here behind it, you’ll notice the Marlene Jack Ceramics Studio, named for the art professor emerita who was a major force in acquiring and transforming the building which used to be the Old Power Plant into the current Ceramics Studio, allowing ceramics students to move from a cramped and dark room to the open, two-story ceiling charming workspace it is today. These names and stories make up a minuscule fraction of the women who have contributed to the College’s history, and the symbolic renaming of buildings acts merely as a thought exercise. The pipe dream of a “College of Mary,” while idealistic, means little if it is not accompanied by concrete steps to work toward a more equal distribution of power, opportunity and access, for people of all genders. Walking around campus today, there’s no need to procure a Williamsburg ghost tour guide — the names of men already haunt this campus on most every building you walk past and the names of those not inscribed in the annals of power lurk beneath, unremembered. 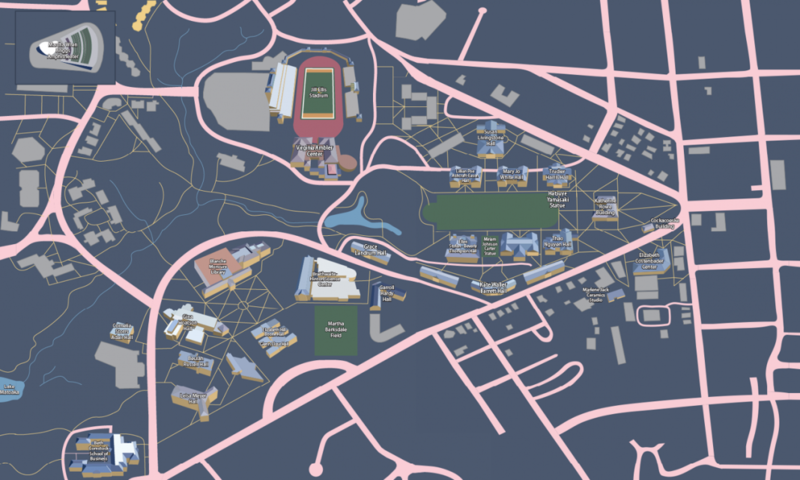 The names on our buildings allow a person’s life to be remembered long past their death, and this reimagined map aims to create a version of living history which doesn’t always err on the side of the status quo. Note: This feature was inspired by “City of Women,”, published in The New Yorker and “School of Women,”, published in the Yale Daily News Magazine. Research for this story was contributed by Lemon Project archivist and administrative assistant Sarah Thomas Ph.D. ’18, computer science professor Virginia Torczon, art and art history professor Sibel Zandi-Sayek, mathematics professor Junping Shi, physics professor Gina Hoatson, American studies and English professor and gender, sexuality, and women’s studies director Elizabeth Losh, history professor Susan Kern Ph.D. ’05, American Indian Resource Center Director and anthropology professor Danielle Moretti-Langholtz, English professor Hermine Pinson and English professor and department chair Suzanne Raitt.